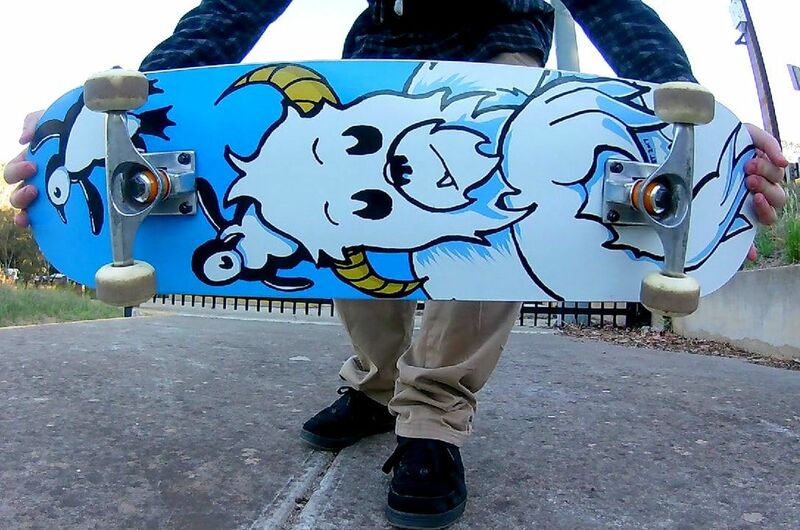 TET holding a Bored Yeti MKII Popsicle Skateboard deck. Originally I was going to create the entire design on the template but I realized I wouldn't be able to match the coloring of the first design. So I settled for doing everything up to the line art old school, then I took a photo with my phone camera. The main thing I wanted to know was how those Sharpie outlines would compare to my digital line art. Looking at the final design on a skateboard, I have to say they look pretty good. You can see a little of the paper texture, where the Sharpie ink has bled slightly, making the design a little rougher, and less clinical. Initially I didn't want to set up the board I ordered (it was intended to be a sample deck) but it didn't feel right ending the video above at the unboxing. I would have loved to have tried more tricks but it was the end of the day, and my flat ground game is a very shallow pool. Plus I didn't want to do anything that would scratch the graphic too much - it's still a sample deck after all. Bored Yeti MKII is available to buy on my five standard board shapes including; Popsicle, Punk Nose, Retro, Mini Cruiser, and Longboard. Purchase just the deck, or buy a complete setup. You can also purchase the design on Clothing, Stickers and other gifts in my RedBubble Store.